As the news on climate change becomes increasingly serious it is all the more important to affirm that the problem has solutions provided the world applies them soon enough. Prominent UK environment writer Chris Goodall surveys some of those solutions in a well-researched fashion in his new book, Ten Technologies to Save the Planet. In combination he shows them adequate to the deep reductions of global greenhouse gas emissions needed over the coming decades. On the renewable electricity front he explores wind power, solar energy and the tides and waves of the oceans. Where fossil fuel continues to be used for electricity he considers carbon capture and storage a viable technology and one which carries with it the additional possibility of extracting carbon dioxide directly from the atmosphere for sequestration. Combined heat and power technologies through fuel cells and district heating plants using biomass offer significant emission reductions. House insulation and airtightness, including refurbishment of existing houses, are easy gains. On transport, he points to the fast advances in technology for battery driven electric cars, and to the large number of companies working on developing biofuels from cellulose. Wood part-combusted to make charcoal and dug into the ground both sequesters carbon and in many soils improves fertility. Finally, he details various better treatments of soil, trees and plants to improve their carbon-sink properties. All the technologies Goodall canvasses already have solid indications of technical feasibility. Some of them, such as wind power, are in substantial operation. Together they present a credible world in which we could live in reasonable comfort and in a great deal more safety than our current path offers. There are further technologies, such as nuclear energy, which Goodall discounts but for which others make a strong case. Altogether there is good reason to feel encouraged. We can decarbonise our energy and our industry. We are not doomed to destruction for lack of alternatives. Why then, in view of the utter urgency of the need, isn’t the world in general and New Zealand in particular getting on with it? Goodall feels obliged to evaluate the technologies in terms of their cost relative to fossil fuel. But why should competitiveness with fossil fuel matter as much as it still seems to? We now understand that the continued burning of fossil fuel is dangerous for the human future. The fact that it may be cheaper in economic terms doesn’t lessen that danger. Within a market economy, Goodall urges measures to put a price on carbon either through direct tax or through capped emissions trading schemes. He points out that a high carbon price (he suggests US$50 per tonne) would make almost all the technologies in his book competitive very soon. Against those who say the economy would be crippled he argues that in fact the impact on GDP will not be large. But even if it were large, governments cannot allow the burning of fossil fuels to continue unhindered. The new technologies have to be adopted as rapidly as possible – by regulation and subsidy if market signals are not sufficient. Unfortunately, many politicians remain scientifically ignorant and vulnerable to vested interests. Our own new government is still dithering, possibly even back-pedalling, on the modest measures adopted in the emissions trading scheme. 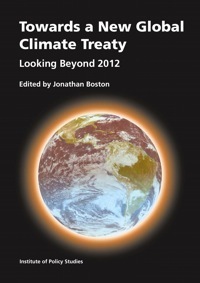 Towards a New Global Climate Treaty: Looking Beyond 2012, edited by Jonathan Boston, with contributions by Ralph Chapman, Pamela Chasek, Steve Hatfield-Dodds, Colin James, Lucas Kengmana, Adrian Macey and Murray Ward, Institute of Policy Studies, VUW, November 2007. The Institute Of Policy Studies at VUW has played an influential role in the development of New Zealand’s climate policy, through books, seminars and conferences. Some of the stuff they organise is so interesting that it makes me (almost) wish I lived in Wellington. This latest book – a follow-up to last year’s excellent Confronting Climate Change – draws on a series of roundtable discussions hosted by the IPS during mid-2007. About 120 people from sectors with an interest in climate policy – energy, agriculture, industry and many others – took part, and their comments provide a counterpoint to the more theoretical considerations of the various chapter authors. I’m not going to attempt a detailed review of the content of the book – it’s sometimes dense, detailed and theoretical – but it does provide an excellent overview of the domestic and international context for the post-Kyoto negotiations, as well as look in considerable depth at the policy objectives the government might adopt, and how that flows from – and impacts – sectoral interests. The chapter on forestry and land use change is particularly valuable, as is Jonathan Boston’s opening chapter, which gives a swift tour d’horizon of the current situation. Boston and Ralph Chapman’s summary of the current science and its implications for emissions reduction targets and stabilisation targets is also highly recommended. You won’t find this at the top of the non-fiction charts, but if you really want to know what’s going on in climate policy development here and overseas, there is no better place to start.